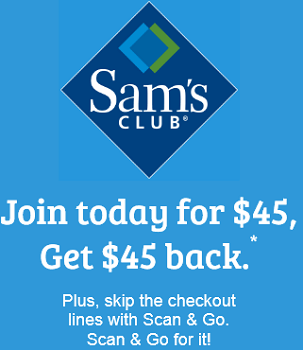 You are here: Coupons/Deals » Deals & Scenarios » Sam’s Club: Join for $45 and Get $45 Back! Enter your email to receive $45 off your first purchase when you get a Sam’s Club Membership for $45. •Plus, skip the checkout lines with Scan & Go. •Scan & Go for it!